We at Woodlands Hospice understand that bereavement is a very personal experience, so it is important that you try to allow yourself time to grieve, be kind to yourself and adapt to the loss of your loved one in a way that is right for you. There may be people and places you want to avoid because the memories are too painful. Special occasions such as birthdays, anniversaries and Christmas may be hard to cope with. You might find it helpful to plan ahead so that you are well supported at these times. Try to express your emotions. Remember that you need time to rest, think and sleep. Try not to forget that children experience similar feelings and need to share their grief. If you can let children talk about their emotions and express themselves. Encourage children to return to school and let them continue with their usual activities. Be gentle with yourself. Try not to bottle up your feelings or suppress your tears, they are an essential part of the healing process. Talking about what has happened may help. Try not to make any major decisions unless you really need to. An opportunity to meet and talk to others, share the experience of bereavement, or to seek advice and support from members of the team. Meet individually with a member of The Family Support Team. 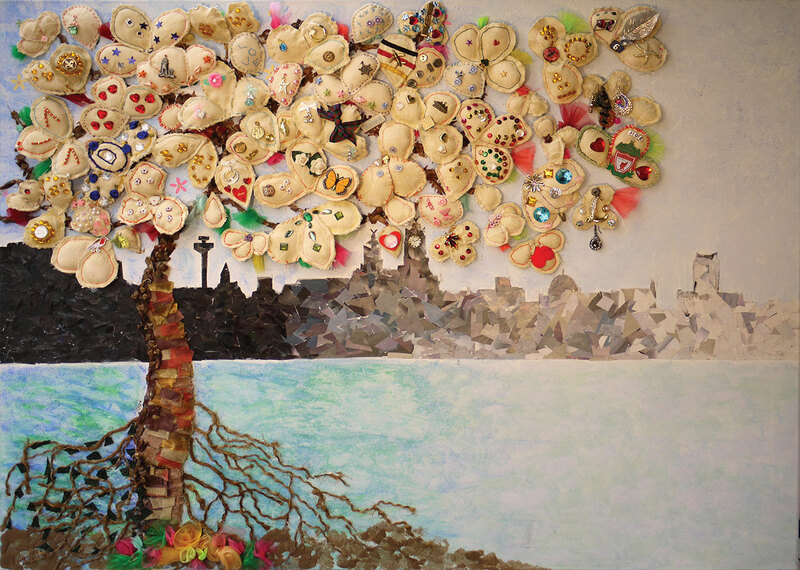 Over the last couple of years the Bereavement Group has undertaken an art project, which captures their bereavement journey. The group were really keen that the art project could be shared and enjoyed by others. Telling a story of a journey that can connect individuals on a personal level and in some way reach out to other bereaved people to bring comfort and hope. It was important to the group that the art work included a backdrop of the Liverpool sky line- as this was a common bond for the bereaved group members all of whom had shared fond memories of times spent with loved ones enjoying the river and dockside area. The Group members also wanted it to include roots from a tree- representing, pain, growth and family. In addition the group members wanted to include a personal sentimental item - each piece unique to that person and telling an individual story, a tribute that can be shared. Together these would form an illustration of a genuine understanding of the impact of losing a loved one. As you can see the completed piece of art work is both powerful and moving, symbolising a journey that reaches out connecting people through their own personal life events of loss and grief. Elaine Pugh approached Kay Jones, Curator of Urban and Community History at Liverpool Life Museum, to enquire about the possibility of exhibiting this inspirational piece of art, which was then agreed. The group’s aim was to share this wonderful legacy with as many people as possible, and they thought what better place to do it than on the waterfront with connections to our heritage and culture. The picture was installed on the 7th of June 2016 , such a proud day for everyone at the Hospice and a fitting tribute to the Bereavement group who have given so much of themselves in honouring and celebrating the lives of people they love and cared for.